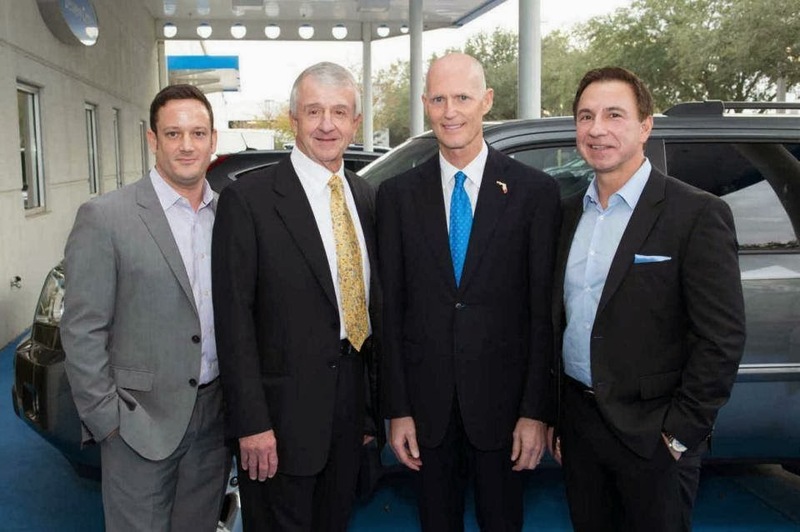 Florida Governor Rick Scott stopped by our Brandon Honda store near Tampa this past Wednesday to reinforce a major proposal that could amount to $400 million in tax savings for Florida drivers. The tax break would reverse some of the legislation we saw in 2009 that sent tag renewals to record highs. As a dealership employee we often electronically administer this work for customers so naturally we heard the negative response in a major way. In my opinion this move is also a symbolic break from much tougher days...both for our state and car dealers. #1) He's more personal than people give him credit for. Like my father, Governor Scott is a mid-western boy by birth and college education. Also like my father he came from humble beginnings in life. He had done his research on my father and while that's what a good politician should do - it was a neat conversation to watch. Say what you will say about them both - but a self made man is exactly that in many respects. Success was neither given nor destined for either. In fact I would also throw our partner John Marazzi into that same breath. These are men who have succeeded in life through hard work, determination in spite of what others were able to provide them in life. Their lives have been more about what they have been able to provide to others in the way of opportunity, growth and success. Don't feel that way about the Governor? That's fine but I'd read this human interest piece and take a break from the politics for a minute. The Governor also made light of his friendly competition with Texas Governor Perry and a small bet he had with the Alabama Governor over the recent BCS National Championship between Auburn and FSU. 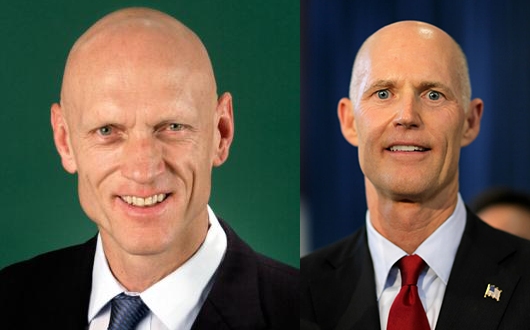 #2) He looks like Peter Garrett, the lead singer from Midnight Oil. "Clearly interested in publicity in the politically crucial Tampa area about a tax cut, Gov. Rick Scott made a second appearance in Tampa in less than a month Wednesday to talk about his proposed cut in vehicle registration fees." Wow even the Tampa Tribune is worn out by two local visits in a 30 day period! Like you've never written virtually the same article before? Ha! #4) People don't see the big picture anymore in politics. They remember only issues (and moments) the media magnifies. And they speak with a venom that makes me sad for my generation. "Great you got to meet the Governor. Just sorry it was THAT one." "Ask him how much money he plans to make drug testing all of florida? He voted for drug testing for welfare and state employees because he owns the largest drug testing provider in Florida. Hes an asshat"
"I couldn't agree with you more. Hes one of the worst thing thats happened to florida." Truth is we probably always spoke this way, save maybe the "asshat" remark. It's Social Media that has now given every one a voice into a stranger's living room and that's both exciting and terrifying to me. Freedom of Speech is important but I'm probably not wrong if I am assuming that these are opinions being formed on a few basic factoids. I'm trying to be more balanced in my approach in life. Am I saying that the Governor deserves your respect just because he is the Governor? No. What I am saying is that if a large majority don't we probably aren't moving anywhere as progressing people. In walking the room that evening and speaking with many of my business associates we all agreed we wouldn't have the stomach for politics. CAR DEALERS not being able to stomach something? Yes. That's what I said. When Governor Scott first got out of the car yesterday he first asked about the healthy of our business. It's funny, growing up with an entrepreneurial father you notice some things. One of my greatest takeaways is watching the personal growth opportunities a business leader can provide to so many. The Governor was pleased to hear our business was growing in the post-recession and eluded to a Florida's fiscal health and the success of "smaller government" and a solid foundation moving forward. This philosophy right here is at the core of what drives entrepreneurial America. I am a huge believer in the impact we've made in our communities as entrepreneurs. Bigger more inefficient governments can drain of our own tax revenues while stunting the growth of many whose success paves the road of opportunity for others. That's a BIG PICTURE issue that is effecting our state here and now. I just hope the next time the Governor (or another politician you consider an asshat) sincerely speaks up, you listen - and don't get lost in the sound-bytes and "red herrings." You might just learn something.